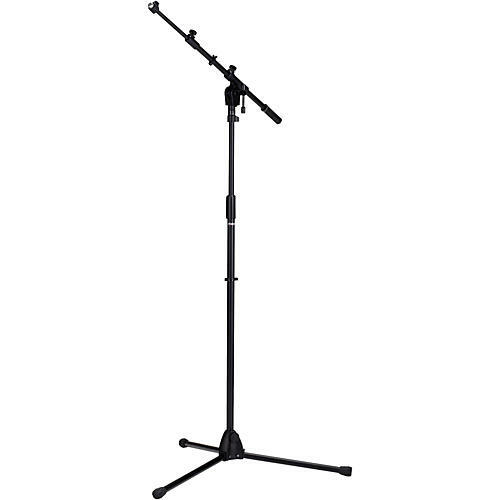 The Iron Works Tour Series MS456BK telescoping boom stand with tripod legs offers remarkable, innovative features in terms of value, performance, and usability. The MS456BK provides secure, versatile mic positioning that makes any miking job faster and easier. The MS456BK is Tama’s "standard" telescoping boom stand with versatile, solid positioning capabilities that make it ideal for any work environment. The die-cast locking thumb nut’s larger, sure-grip design allows greater leverage for faster, easier set-up and breakdown. And Iron Works’ sturdy zinc, die-cast adjustment collar will be appreciated by musicians previously burned by the performance failure of flimsy plastic collars. Abandoning the weak standard gripping methods used by economy grade stands, the Iron Works Tour stand Cast-Grip Boom Tilter utilizes two zinc die-cast pressure pads that maximize surface gripping area to deliver optimal holding power. A uniquely shaped tripod base and cavity cradles the boom when folded for storage—a simple detail that helps pack gear tightly. With its solid-core telescoping iron boom arm and counterweight, Iron Works boom stands safely and securely hold heavy microphones and accessories.